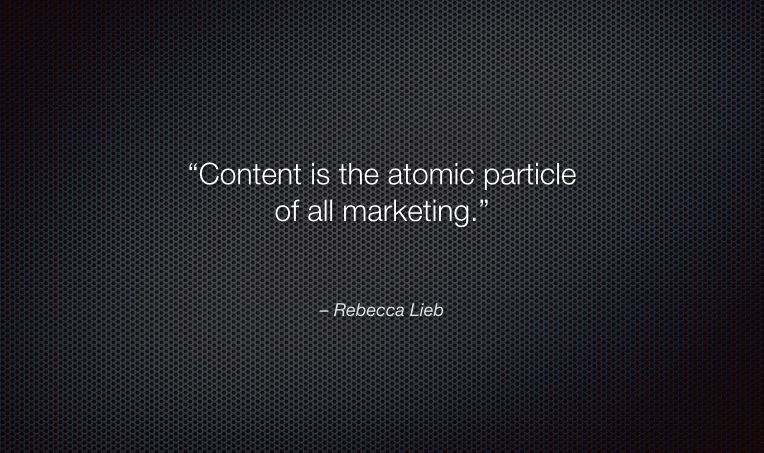 I write a lot about content because, as Altimeter analyst Rebecca Lieb says, “Content is the atomic particle of all marketing.” It’s what marketing is made of. It’s how you deliver value to all customers, including the ones who aren’t paying you. It serves every step of the buyer’s journey. It’s how you make people aware of your brand and move them toward familiarity, purchase, and loyalty. Content and the Big Idea: What’s your theme song? What’s your one big message, the important idea that can drive your content machine? The top 50 content marketers: Learn from the best. A culture of content: Content marketing can’t succeed if everyone looks to the “content guy.” Here’s how to build content into the organization and make it everyone’s job. My favorite article: What if you could amplify your effectiveness by turning every piece of content into 20? What if you could build a machine to make this happen? Learn how to make Many Pieces of Content from One. Follow the full index: All articles on content marketing, to see everything, including new articles, as they appear. Hilarious brand mission video spoof. No, wait — what? Holiday Marketing Opportunities: Does Your Customer Want Sleigh Bells?